Organisation such as Melbourne Water and local governments need to strategically plan drainage systems to ensure future urban growth and re-development does not cause flooding and environmental problems for future residents. Fisher & Fisher have over 8 years of experience in preparing new schemes and then updating and reviewing older schemes to ensure the scheme rates and infrastructure match the current catchment imposed financial and hydraulic conditions. Fisher & Fisher are principal consultant for the review of Development Services Schemes for Melbourne Water. 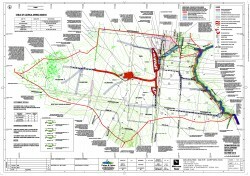 We confidently approach each review and understand that each has unique challenges such as urban growth boundary extensions; flooding concerns, developers redirecting flows and varying environmental constraints. Fisher & Fisher can apply a range on modelling tools, including rational method analysis, and programs, such as RORB and HEC-RAS. As with all of our projects, we provide a complete report and prepare thorough scheme plans incorporating both engineering and environmental considerations for our clients.